Today was Miguel's parent-teacher conference which is always fun. When he was 3, he asked another child to stick a bead in his ear which necessitated an early pick-up and a trip to the ENT. When he was 4, there was the shoe polish incident. Good times, I tell ya. We could only imagine what awaited us at this, his first conference as a 5 year old. The teacher began by telling us that he is having an amazing year. His reading and writing skills are exploding. He is doing a lot of math work. He challenges himself in all areas and works with a variety of children. He has become a leader in the classroom. As Luisa and I smiled and nudged each other proudly, the teacher said that there was one story she had to tell us, however. One day, another child was working with the math materials and Miguel was lying across the child's work table. Then, Miguel put his feet on a shelf near the table to balance himself. The whole shelf collapsed, sending math materials everywhere. Montessori math materials people. Beads. Small wooden spindles. Cubes. Thousands of tiny items used for counting. Apparently, it was the Crash Heard Around the School. Despite the property destruction, we love our mischievious Miguel. 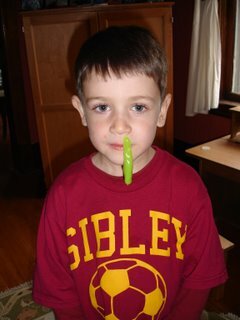 Now, if we can just get his sinus infection under control, we'll be set. Good luck with that...glad it went well! You know, in the past all we've heard in the conferences is great things about Jack, and this year, the "challenge" list was as long or longer than the "excellent" list. I think they want to finally bring balance.That they could only find an accident (involving achy backs and imminent arthritis from picking up all the beads) seems pretty great.